If you want to read the Bible, but you’ve found it difficult to do so, you may need to ask yourself some questions. Here are a few ideas to get you started. Do you need a reading plan? Do you want to use a checklist of all the books of the Bible and read a book at a time as you feel led? Keeping notes or a journal can help you 1) personally engage with God’s Word; 2) see your progress; 3) remember and process verses, chapters, or books of the Bible. There are times I’ve found it helpful and enjoyable to use a 3 ring binder with tabs I title (1-31 or A-Z) to keep track of my notes by topics or books of the Bible. Do you want to start in the New Testament, with the writings and stories about Jesus, and and then move to the Old Testament? 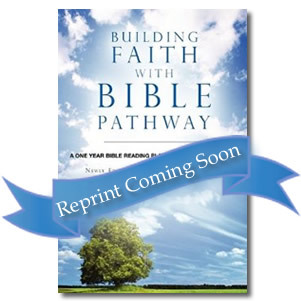 Do you want to read straight through the Bible beginning with the Old Testament? Do you know that there are a few spots in the Old Testament where people can get bogged down? If this happens to you, don’t quit – keep going. What are your goals in reading the Bible? Reading, just to get through it, is not ideal. Reading it just once and putting down, never to pick it up again, is not so good. Reading to come to know God and His ways is better. We want to fall in love with this God who created us and we want to find a way to continue to read God’s Word so that it touches and re-directs our lives. Reading and learning is key. But we need to start somewhere. What will it take for you to read God’s Word? A recent sermon here in Chicago encouraged me to actually open my Bible and start reading it on a [just about] daily basis. I don’t think I would have done it without your book to help guide me! I’m still in Genesis, but excited to progress and learn more, as well as strengthen my relationship with God. Awesome Margo! I will pray for you to stay with it and be strengthened until you can’t help but not read it!